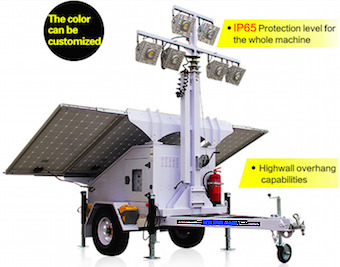 Security Solar Light Tower. Used Through Out The United States and World wide by FEMA Federal Emergency Management Agency, DHS Department of Homeland Security, Disaster Recovery Efforts, Red Cross Disaster Relief, European Union, EU Refugees Camps, NATO North Atlantic Treaty Organization, Disaster Preparedness & Recovery. Solar Perimeter Security Lights Self Contained, integrated high efficiency solar panels, controller, human infrared motion sensor module, high-capacity lithium-ion battery and LED Lighting technology into a small compact housing unit. 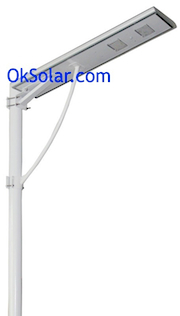 Solar Security Lights, Solar Powered LED light integrated high efficiency solar panels, controller, human infrared motion sensor module, high-capacity lithium-ion battery and LED Lighting technology into a small compact housing unit. 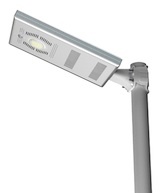 Solar LED Lighting 40 Watts LED, Running Time Dusk to Down, World Zone 4 (4-5 Hours of Daily Solar Radiation).